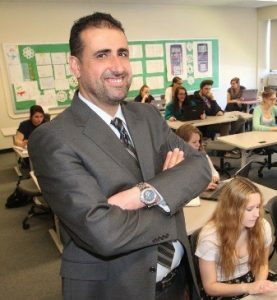 Osama Ta’ani is an assistant professor of mathematics education who joined the Department of Mathematics in 2011. He teaches undergraduate and graduate mathematics courses for pre-service and in-service teachers. He started his professional life teaching in primary and secondary schools in Jordan, Saudi Arabia, and the United States. After developing a passion for instruction he pursued a PhD in Mathematics at New Mexico State University. During this time he taught courses ranging from developmental mathematics through differential equations. His research interests include mathematics education, history of mathematics, and using historical sources (specially from Medieval Islam) in teaching mathematics. His research focuses on using history in mathematics education, in particular, how history can be implemented in classroom teaching, and how teachers can integrate historical sources in the mathematics curriculum as an instructional tool. This tool provides students with both flexible thinking and opportunities for comparison as well as improves creative thinking while creating a network of ideas. Osama is busy outside of class with his three children. He enjoys hiking, fishing, traveling, and canoeing. Practices for Better Mathematics Teaching for Prospective Teachers. An Inaugural Lecture. Plymouth, NH. March 2015. Using Visual Representations to Meet the Standards for Mathematical Practice. Workshop, New Hampshire Teacher of Mathematics Conference. Concord, NH. March 2014. Using History of Mathematics and Primary Sources to Help Teachers to Meet the Common Core State Standards. Workshop, New Hampshire Teacher of Mathematics Conference. Manchester, NH. April 2013. Using Original Historical Sources in Teaching Mathematics for Preservice Elementary and Middle School Teachers. MAA session: Mathematics Education II, Joint Mathematics Meetings, San Diego, January 2013. Multiple Paths to Mathematics Practice in al-Kashi’s Key to Arithmetic: A Preliminary Report. MAA Session on Treasures from the Past: Using Primary Sources in the Classroom, Joint Mathematics Meetings, New Orleans, January 2011. Al-Kashi’s Key to Arithmetic: Its Context, Contents, and Educational Impact Up Through the Ottoman Empire. MAA General Contributed Paper Session, III, Joint Mathematics Meetings, New Orleans, January 2011. The Concept of Derivative as Presented in Nineteenth Century American Calculus Textbooks. History and Theories of Mathematics Education Miniconference, New Mexico State University, May 2010. Stochastic Processes for Financial Mathematics. Stochastic Processes Seminar, New Mexico State University, 2008. Brownian Motion, Martingales. Stochastic Processes Seminar, New Mexico State University, 2008. Named Ed and Marilyn Wixson Professor of Mathematics, June 2014. The Science Education Alliance award, SCIAD Program, May 2009. Excellent Teacher Honor, Dar al-Fikr Schools, Saudi Arabia, November 2005. Excellent Teacher Honor, Dar al-Fikr Schools, Saudi Arabia, November 2002.